Sixty-seven (67) units consisting of twelve (12) 2-bed 1-bath, forty-nine (49) 2-bed 2-bath and six (6) 3-bed 2-bath flats. 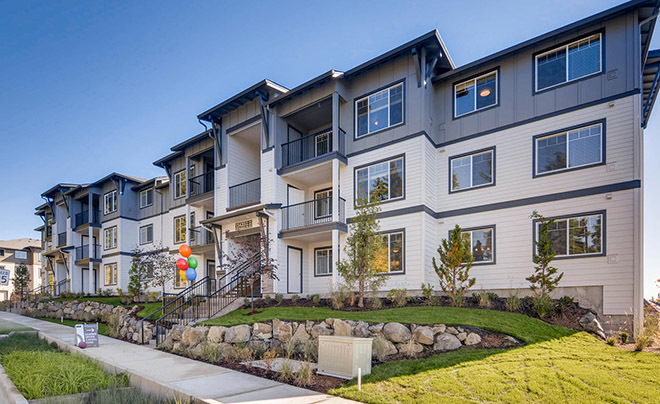 Located in the exclusive Bethany neighborhood, this newly-built apartment community began lease-up in the 3rd quarter of 2018 and move-ins began in October. Final certificates of occupancy are pending and expected in the fourth quarter of 2018. Investors will have the advantages of new construction with low maintenance and minimal capital and turnover expenditures. Much of the land in Washington County is outside the urban growth boundary and cannot be developed. Washington County is a regional economic powerhouse with per capita income forecast to significantly outpace that of adjoining Multnomah County. Click here to view this property's custom website and complete the confidentiality agreement to access the offering memorandum.